Every so often the UrbanCincy team strolls through the interwebs to find out what kinds of video content people are producing about Cincinnati in the digital age. It turns out that the overwhelming majority of that content is commercial in nature, but every once in a while we find some good old fashion urban b-roll. One of the most recent items we came across is Cincinnati From Devou Park by Michael Toffan. The nearly three-minute video slowly pans about the views from one of the region’s most popular vantage points. It is a slow and methodical video set to the song ‘Every Woman’ by Stephan Baird. 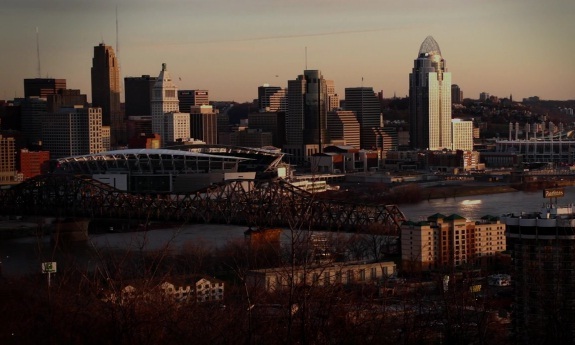 The video expectedly captures the views of downtown Cincinnati and Covington, but it also intimately showcases ongoing construction at The Banks (0:33), the aging Brent Spence Bridge (0:53), and barge traffic on the Ohio River (2:05).